Fife council; caused by the resignation of Labour councillor Lesley Laird, who had served since 2012. She is now the MP for Kirkcaldy and Cowdenbeath. Stop laughing at the back, this is important. The wreck of the Tay Bridge with the loss of 76 railway passengers and staff, as retold in these memorably awful lines from the poet and tragedian William Topaz McGonagall, was one of the defining moments of Victorian Britain. It’s easy to forget now that the original bridge was seen as engineering marvel, an elegant solution to the problems of Scotland’s deeply-indented coast. On its opening in May 1878 it gave the Fife coalfield a shot in the arm by providing easy access to customers in the port and city of Dundee; while also cutting the journey time between Dundee and Edinburgh by an hour. McGonagall wrote an earlier, and equally execrable, poem praising the original design. The bridge’s designer, Thomas Bouch, was knighted for his efforts, and by that time was hard at work designing a similar crossing to span the Firth of Forth. The Forth has always been a barrier to travel in eastern Scotland. In 1879 its lowest fixed crossing was at Stirling, the bridge which by tradition separated the Lowlands from the Highlands. Anything below Stirling had to cross the estuary by boat. The railways had established a ferry link from Burntisland on the Fife coast to the Edinburgh suburb of Granton; but there was a shorter and longer-established route at the estuary’s narrowest point, between the West Lothian village of South Queensferry and the Fife village of North Queensferry. The Queen referred to here is the eleventh-century St Margaret, who made the crossing many times; her final crossing, in 1093, was in a coffin on the way to her funeral at Dunfermline Abbey. By the 1870s the ferry was in heavy demand and calls for a fixed bridge between the two Queensferrys were becoming overwhelming. It was the obvious place to put Bouch’s fledgling design. The storm which blew up on the last Sabbath day of 1879 changed all that. The inquiry into the disaster laid bare a series of shortcomings ranging from poor maintenance and defective construction materials all the way to Bouch’s design itself, which failed to make sufficient provision for wind loading on the structure. The reputation, and indeed the health, of Bouch never recovered; he died shortly afterwards, and his Forth design – a suspension bridge – never saw the light of day. Nonetheless the Forth Bridge needed building, and a strong and radical new design was approved and built. Made in Scotland from girders, the Forth Rail Bridge was opened by the Duke of Rothesay (later Edward VII) in 1890 as the largest cantilever bridge in the world. One hundred and twenty-eight years on, it remains an icon of Scotland and indeed of Britain. In 2004 the Royal Mint put the bridge on the pound coin; the Bank of Scotland and the Clydesdale Bank have both put the bridge on banknotes. In 2015 the Forth Bridge became Scotland’s sixth UNESCO World Heritage Site, after St Kilda, Edinburgh Old and New Towns, Neolithic Orkney, New Lanark and the Antonine Wall; the following year a poll for VisitScotland voted the bridge as Scotland’s greatest man-made winder. And, with nearly two hundred trains crossing the bridge on an average day, it remains a vital economic link for the Kingdom of Fife. But two hundred trains a day is not enough to meet the demand. The Queen’s Ferry remained in operation for road traffic after the rail bridge opened, and by 1960 it was handling over 600,000 motor vehicles each year. A new bridge was needed, and the Forth Road Bridge was the result, opened in 1964. It was at the time the longest suspension bridge in Europe, and it continued the transformation of Fife’s economy. What the Forth Bridges did for this corner of Scotland was turn it into an Edinburgh commuter area. Despite the order of the ward name, the largest centre of population here is Dalgety Bay which, like the road bridge, substantially dates from the 1960s. Its population has grown from 1600 in the 1951 census to over 10,000 now; many of those people commute to work over the water in Edinburgh, and a railway station was opened to serve the town in 1998. Inverkeithing is an older town, a royal burgh and port midway between Dalgety Bay and Dunfermline; while down on the peninsula is the village of North Queensferry. As well as the unrivalled views of the bridges, visitors come to North Queensferry for Deep Sea World, one the largest aquariums in the UK; in population terms it’s relatively small with under 1,100 souls, but those electors include a famous name. Gordon Brown, the former leader of the Labour Party and Prime Minister from 2008 to 2010, has lived in North Queensferry for many years. The Forth Road Bridge is of a suspension design, in which the roadway is suspended from strong cables which span the river and take the weight of the bridge. In 2004 it was found, following experiences with similar bridges in the USA, that the cables had a corrosion problem which had reduced the strength of the bridge. Bad news: as McGonagall put it in the surely-unimprovable closing lines of The Tay Bridge Disaster, “for the stronger we our houses do build the less chance we have of being killed.” (I said stop sniggering at the back.) By 2004 the Forth Road Bridge had carried over 250 million vehicles and was regularly operating at over twice its designed traffic load. Something had to be done to repair or relieve the bridge, and it would not be cheap. Who was going to foot the bill? By this point in time the Forth Road Bridge tolls were already a hot political potato. The construction cost of the bridge had been paid off by 1993 but the tolls had been retained to cover maintenance. In late 2005 the bridge operators, the Forth Estuary Transport Authority, came up with a plan for variable tolls which would have seen the cost of crossing the bridge quadruple from £1 to £4 for a single driver in the rush hour. The plan was taken seriously by the Scottish Government, then a Labour-Lib Dem coalition, which had to approve the plan; but there was opposition from Labour figures in the Westminster government and from Fife council, then run by the SNP, which produced a counter-proposal to abolish the tolls altogether. Things came to a head in early 2006 with the campaign for a Westminster by-election in the local seat of Dunfermline and West Fife, which resulted in a victory for the Liberal Democrats; and the variable tolling plan was dropped. The following year the Labour-Lib Dem coalition was defeated in the 2007 Holyrood elections, bringing to power a minority SNP administration led by Alex Salmond. (Whatever happened to him?) 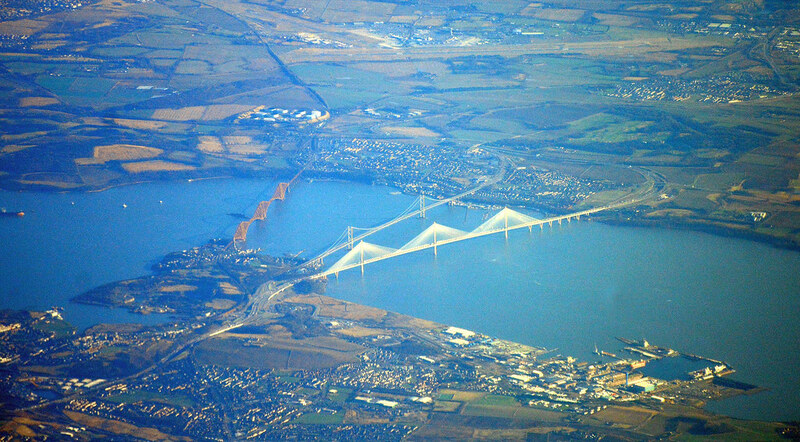 The SNP manifesto included the abolition of bridge tolls in Scotland – which came into force for the Forth Road Bridge in February 2008 – and the construction of a new bridge at public expense to replace the Forth Road Bridge. The Queensferry Crossing opened last year and took away the traffic from the old bridge, which is now restricted to buses, bicycles, taxis and pedestrians. It’s so new it doesn’t appear on the ward map below yet. With all those developments improving the links between this ward and Edinburgh, the pull of Inverkeithing and Dalgety Bay for wealthy Edinburgh commuters is only going to get greater. It’s pretty important as it is. In the 2003 Fife council elections Dalgety Bay East was one of only two of Fife’s then 78 wards to elect a Conservative councillor; a rare Tory outpost in an area which was mostly solidly Labour at the time. 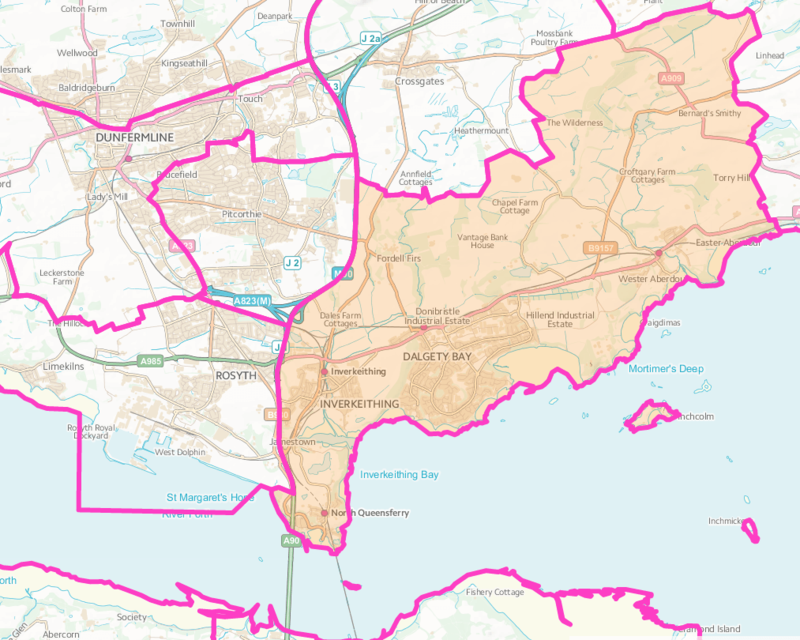 The modern ward was created in 2007, covering the two towns of the name and a hinterland to the north-east, including the village of Aberdour and the uninhabited island of Inchcolm; in that election it returned one councillor from each of Scotland’s four main parties, with the SNP topping the poll on 29%. The Lib Dems lost their seat in 2012, but their transfers ensured it was Labour rather than the SNP who picked up the gain. The 2017 election to Inverkeithing and Dalgety Bay was on new ward boundaries, now including North Queensferry which had previously been part of Rosyth ward; and was also in new political circumstances following the independence referendum, SNP surge and Labour collapse. The Labour collapse here was mostly to the benefit of the Conservatives, who more than doubled their vote to top the poll on 36%, to 31% for the SNP and just 18% for Labour. That surge seems to have been a surprise to the local Tories who only ran one candidate, outgoing councillor Dave Dempsey; had they gone for two seats they might have got them. The Tory surplus elected the Labour candidate Lesley Laird, and then the Unionist transfers lined up behind independent candidate Helen Cannon-Todd, who started with only 7% but can count herself unlucky to finish just 18 votes behind the second SNP candidate in the final reckoning. Dempsey and Laird both went on to stand in the snap general election just a month later in the Kirkcaldy and Cowdenbeath constituency. Dempsey again more than doubled the Conservative vote share, but it was Laird who took the seat back for Labour; she won with a majority of just 259 votes to end a two-year SNP interlude in what seven years earlier had been, for Gordon Brown, the safest Labour constituency in Scotland. There was no such luck for David Coburn MEP, the first and so far only UKIP representative ever elected in Scotland; he finished fifth and last in Kirkcaldy and Cowdenbeath with just 1%. The Kirkcaldy and Cowdenbeath seat includes Dalgety Bay and Aberdour but not Inverkeithing and North Queensferry, which form part of the Dunfermline and West Fife constituency: that was also a close Labour versus SNP contest, but it was the nationalists who held onto that seat with a majority of 844 votes. With Laird’s departure to Westminster, proportional representation means that Labour are defending this by-election from third place with just 18% of the vote. Their defending candidate is Billy Pollock, an ex-soldier and former Fife councillor who won a by-election for Dunfermline South ward in 2015, but lost his seat in 2017 to the Conservatives. The SNP hold two of the four council seats here, but they are starting from 31% and picked up very few transfers in last year’s election. With this by-election being held under the Alternative Vote, the 50% required for victory looks an uphill struggle. Their candidate is Neale Hanvey, who was a councillor for Dunfermline Central ward from 2012 until 2017 when he lost his seat to his running-mate Jean Hall Muir; a rather embarrassing loss, as Hanvey was the SNP group leader going into the election. So on paper the Conservatives might look best-placed for a gain; they topped the poll here in May 2017 and also have the luxury of running against Fife council, whose administration is a grand coalition of the SNP and Labour. However, their selection of Dave Coleman, who runs a construction consulting company and is president of Dalgety Bay cricket club, may have backfired following controversy about past Facebook comments of his seen as derogatory to disabled people. An eight-strong candidate list features two independent candidates: Peter Collins, a community campaigner and public gardener from Dalgety Bay, and Alastair MacIntyre who has contested his home Rosyth ward in 2012, a 2015 by-election and 2017 – his best performance thus far was in 2012 when he polled 101 votes as the UKIP candidate. Callum Hawthorne returns as the Lib Dem candidate after his sixth-place finish last year, and the ballot paper is completed by Mags Hall for the Green Party and Calum Paul for the Libertarian Party. The picture of the three Forth Bridges is by Mike McBey and released under this Creative Commons License. Cumbria county council and Carlisle council, Cumbria; both caused by the death of Labour councillor Hugh McDevitt at the age of 70. He had served since 1995 on the city council and since 2005 on the county council, and was described as a caring and conscientious local politician who made a positive and lasting difference to his community. We cross over the border into England, but not very far. Carlisle is an isolated city with a very wide catchment area – the nearest larger settlement is the Tyneside conurbation, sixty miles to the east – and it is the main service centre for a fair chunk of Scotland. Those Scottish banknotes I mentioned earlier with the Forth Bridge on them will have no problem being accepted in the city’s shops. The Denton Holme area lies immediately to the south-west of Carlisle city centre, on the far side of the River Caldew. This is a classic Victorian suburb where housing and industry are cheek-by-jowl; within the ward boundaries is Shaddon Mill, which at one point was the largest cotton mill in the UK with the eighth-tallest chimney in the world. That’s according to the local tourist board, anyway. The cotton may have gone, but there are still plenty of jobs here thanks to the proximity of the city centre and to the Pirelli factory on the outskirts of town, which supplies a significant number of the UK’s vehicle tyres. 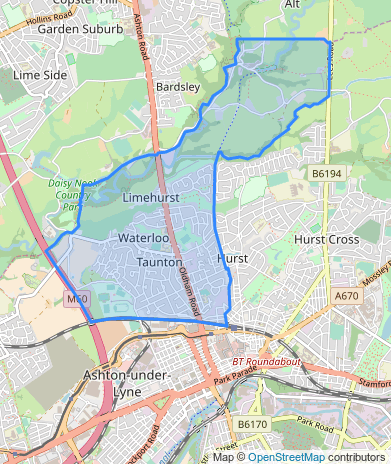 In the 2011 census Denton Holme returned high employment levels and was in the top 90 wards in England and Wales for the “semi-routine” employment category. 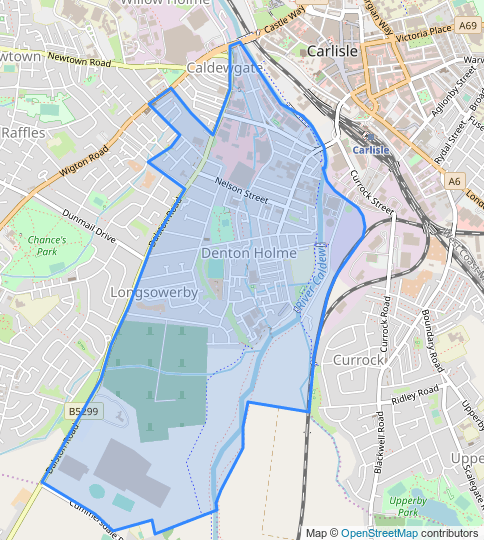 The Denton Holme city ward shown in the map above has unchanged boundaries since at least 1983, and from 1981 to 2013 was coterminous with the Denton Holme county division; the present Denton Holme county division is about two blocks larger, so to all intents and purposes is basically the same unit. There have been 37 elections on these or almost on these boundaries since 1981, and 36 of those have been won by Labour: the one that got away was the 1993 county council election, when it appears that Labour failed to get their nomination papers in and weren’t on the ballot. That was a Lib Dem win. The most recent county council election in 2017 saw Labour lead the Conservatives 60-27; while the May 2018 city council elections saw no swing from that result with Labour beating the Tories 61-28. So, not much chance of any change here and we can be reasonably confident of two Labour holds. Defending the county seat for Labour is Karen Lockney, a lecturer at the University of Cumbria who gives an address some way outside the city, in a small village near Penrith. She’s up against the Tories’ Geoffrey Osborne, who fought St Aidan’s ward in the last two city elections and had a near-miss in Belle Vue division in the 2017 county elections. Also standing are the Greens’ Helen Davison and Phil Douglass for UKIP. For the city council by-election the defending Labour candidate is Lisa Brown, a mature law student and campaign co-ordinator for the party’s Carlisle branch. She is up against Tory candidate Syed Ali, who stood here in May’s city elections and the 2017 county elections. Rob Morrison stands for the Green Party and Phil Douglass for UKIP (again) complete the ballot paper. Whoever wins the city council by-election may well need to work fast to secure reselection, as the 2019 Carlisle city election is likely to be on new ward boundaries with 13 fewer councillors than previously. Tameside council, Greater Manchester; caused by the death of Labour councillor Catherine Piddington at the age of 59. She was a long-serving councillor, having first been elected in 1990; Piddington was for many years the council’s cabinet member for environmental services, and was the longest-serving member of the Greater Manchester Waste Disposal Authority. For our final by-election of the week we come south to the foothills of the Pennines. Ashton-under-Lyne is the largest town within the Tameside district of Greater Manchester. A nineteenth-century gazetteer described Ashton as “bare, wet and almost worthless” before the cotton trade came to Lancashire, and some people (particularly in Stalybridge) might have fun arguing that not much has changed since to dispute that assessment. That would be a little unkind, for Ashton has opened up somewhat in the twenty-first century: the completion of the M60 motorway in 2000 gave easy access to the town, while the tram system was extended here in 2013. In advance of that IKEA opened a store in Ashton in 2006, their tallest store in the UK and the first to be located in a town centre. Waterloo ward lies to the north of IKEA, and is the northern quarter of the town along the arrow-straight old road to Oldham. The ward covers part of the Daisy Nook country park, a local beauty spot, but for the most part is built on with housing of various vintages. One of the few parts of the ward remaining is the Roy Oldham Sports Village; named after a long-serving former leader of Tameside council, the sports village is home to the non-league football side Curzon Ashton. 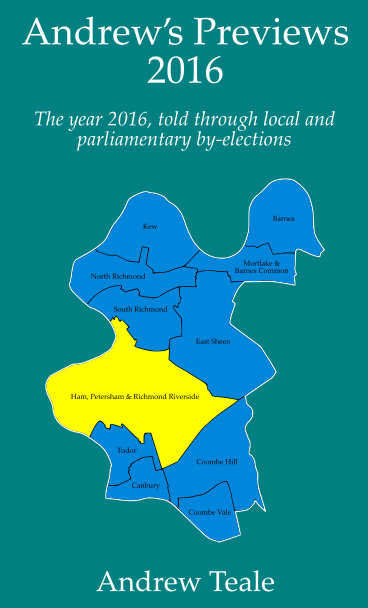 Waterloo ward’s elections normally contain little of interest. This is a safe Labour ward, with last May’s elections seeing a Labour lead over the Conservatives of 57-29. However, proceedings for this poll have been enlivened by a messy Labour selection, as their original candidate was dropped at the last moment when the Labour party found out she had council tax arrears. She didn’t take it well, and took to social media to complain that Labour was discriminating against poor people. Your columnist has a few things to say in response to that. Firstly, being poor and not paying your council tax are not the same thing. Secondly, this sort of revelation reflects badly both on the person concerned and the party which nominated them: we expect our elected representatives to be whiter than white, and that’s an attitude that goes back millennia. The very word “candidate” derives from Latin and earlier roots meaning “to make white or bright” or “to shine”, and recalls the fact that people seeking political office in ancient Rome wore white togas to identify themselves. Finally, and probably most importantly from the Labour point of view, the Local Government Act actually bars councillors from voting on the budget if they are behind with their council tax payments. So this column would submit that Labour did the right thing in installing a replacement defending candidate, who is local resident Pauline Hollinshead. The Conservatives have selected Therese Costello, from Dukinfield; and the Green Party’s Lee Huntbach returns from May’s election to complete the ballot paper.